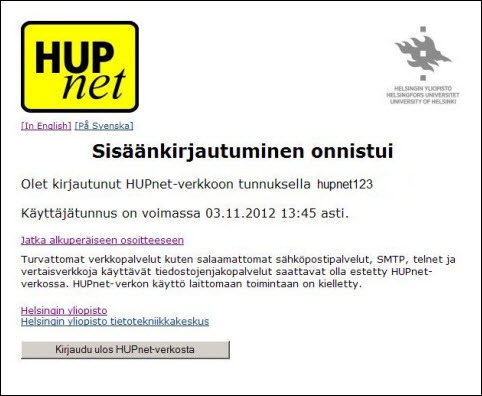 The HUPnet account only allows the user to connect to the University of Helsinki visitor network with their own computer or mobile device. The account can be used to access the library databases. The account cannot be used to log in to university workstations. The account is valid for one day or one week from the first use. Passwords for HUPnet accounts cannot be changed. If the password is lost or forgotten, a new HUPnet account must be created. Even Helpdesk cannot view or change the password. If you try to log in to HUPnet with an expired account, you will receive an error notification telling you that the account has expired. The validity period of a HUPnet account will not be extended. Instead, a new account can be created if necessary. Connect to Univ Helsinki Hupnet. Launch the Web browser. If the browser does not automatically redirect you to the HUPnet login page, try the address https://login.hupnet.helsinki.fi. Connect to the wireless or wired HUPnet network. You will need to log in when connecting to the HUPnet network and also again at regular intervals when using the network. You will not be able to connect to the Internet through the HUPnet network without logging in successfully. How would you improve these instructions? Helpdesk and chat service weekdays from 9 a.m. to 3 p.m. When contacting us, please refer to the instructions for sending a support request so that we can help you as quickly and effectively as possible.